Messier galaxies M84 and M86 are part of Markarian’s Chain, a striking stretch of galaxies that lie along a curved line near the heart of the Virgo Cluster. 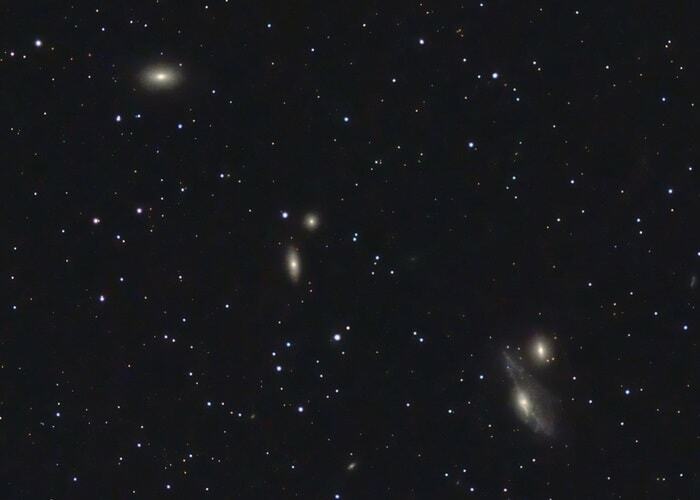 The string of galaxies – which also includes NGC 4477, NGC 4473, NGC 4461, NGC 4458, NGC 4438 and NGC 4435 – occupies more than a full degree on the border between Virgo and Coma Berenices and can be seen in an 8-inch reflector on a clear, dark night. Markarian’s Chain was named after Benjamin E. Markarian, an Armenian astrophysicist who was the first to discover that the galaxies share a common motion through space. 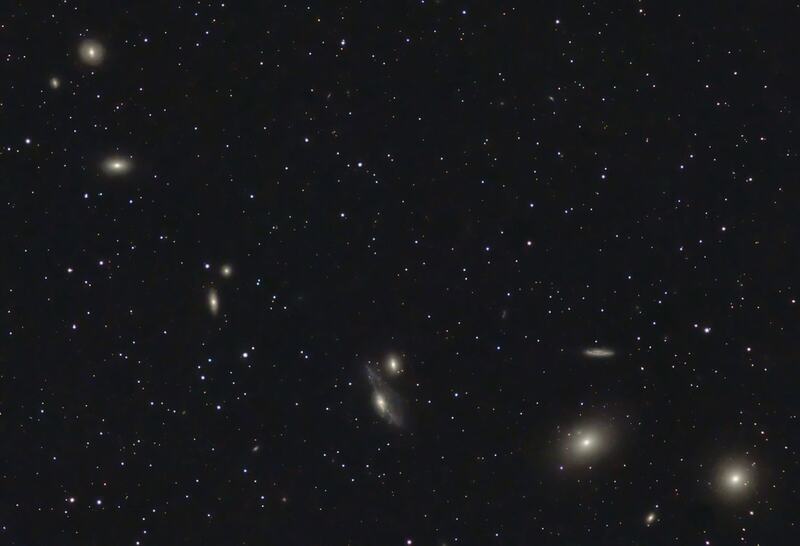 At least seven Markarian galaxies appear to move coherently, while others are merely superposed in the same line of sight. The dominant galaxy in this region of the sky is Messier 87, also known as Virgo A, the supergiant elliptical galaxy that lies at the centre of the Virgo Cluster, near the Markarian galaxies. 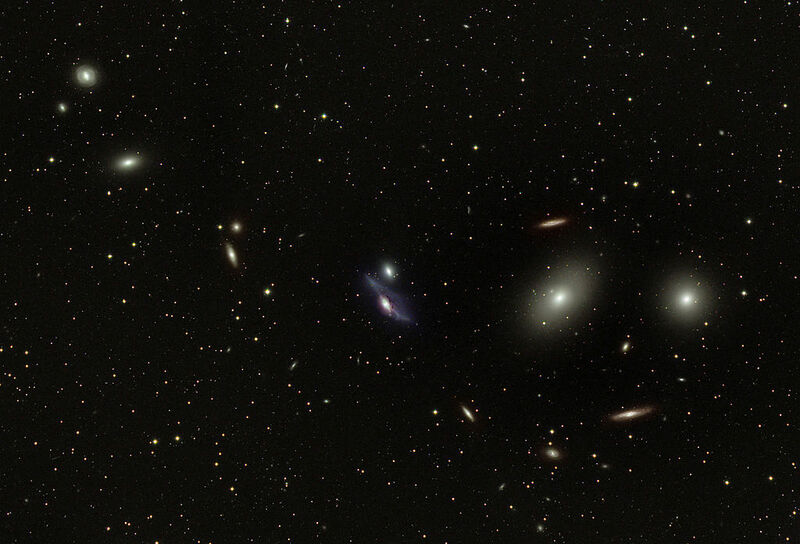 Markarian’s Chain is found just to the north of M87. 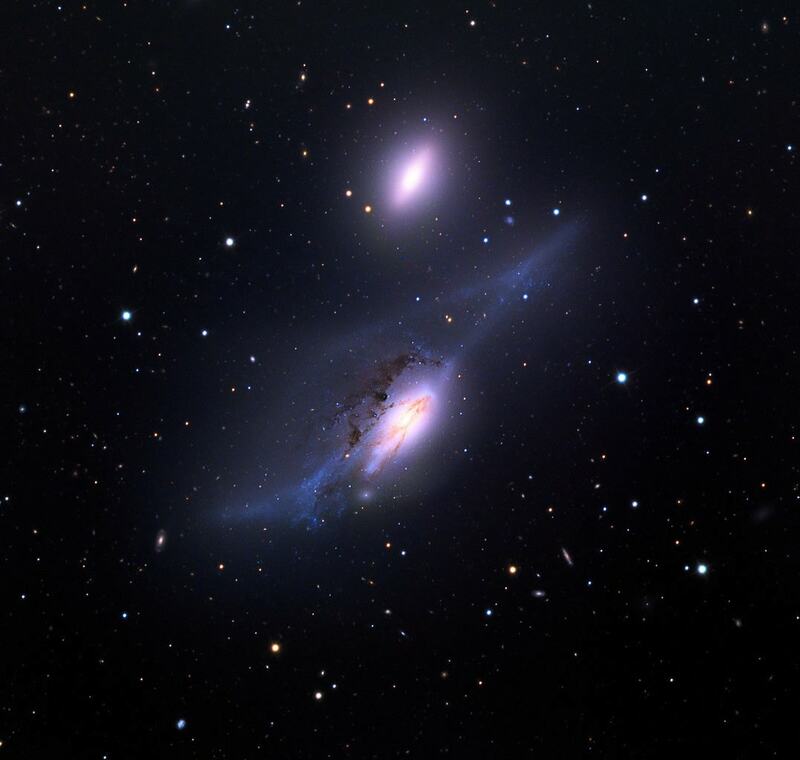 Three considerably smaller elliptical galaxies – NGC 4476, NGC 4478 and NGC 4486A – can also be seen in the immediate vicinity of M87. The first galaxies in Markarian’s Chain to be discovered were the bright and large, but featureless elliptical or lenticular galaxies Messier 84 and Messier 86 in Virgo, first catalogued by Charles Messier in 1781. Other members of the galaxy chain were included in the New General Catalogue of 1888 by John L.E. Dreyer. The galaxies NGC 4435 and NGC 4438 in Virgo constellation form a well-known interacting pair known as the Eyes Galaxies. The galaxies’ interaction brought the pair within 16,000 light years of each other in the past and the gravitational forces of the encounter ripped away material, dust and gas from each of the galaxies. The galaxies were nicknamed the Eyes because they look like a pair of eyes in small telescopes. 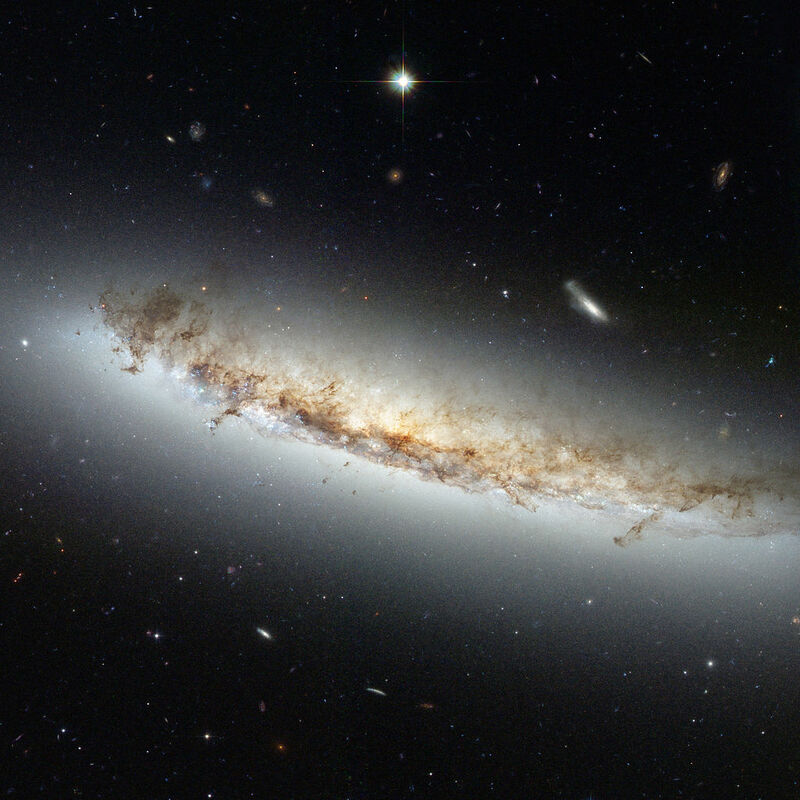 NGC 4461 is a lenticular member of the Virgo Cluster, also catalogued as NGC 4443. The galaxy is located in Virgo constellation and has an apparent magnitude of 11.0. It was discovered by William Herschel in April 1784 and then found independently by Lord Rosse in April 1849, which led to the galaxy’s double listing in the New General Catalogue. NGC 4461 has an apparent size of 3.4 by 1.4 arc minutes. 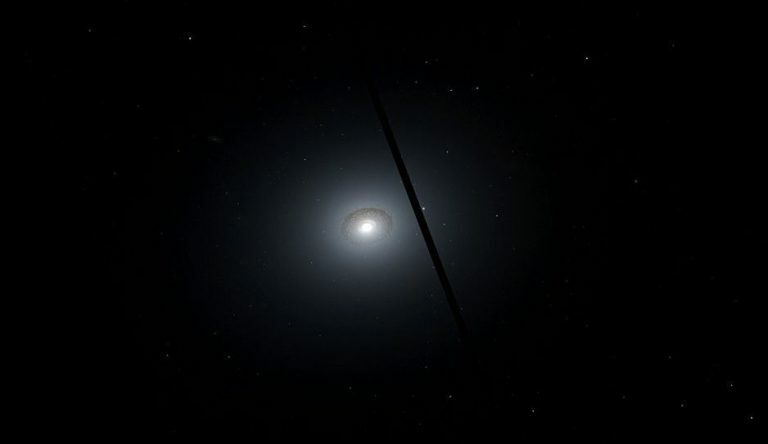 NGC 4458 is an elliptical galaxy in Virgo, about 55 million light years distant from Earth. Also discovered by William Herschel in April 1784, the galaxy has a visual magnitude of 11.8 and an apparent size of 1.4 by 1.2 arc minutes. NGC 4477 is a Seyfert-2 barred lenticular galaxy located approximately 49 million light years from Earth in Coma Berenices constellation. The galaxy has a visual magnitude of 10.4. Its longest bar spans 67,000 light years and the shortest, 60,000 light years. NGC 4477 was discovered by William Herschel on April 8, 1784. NGC 4477 – Hubble Space Telescope – Hubble Legacy Archive. Based on observations made with the NASA/ESA Hubble Space Telescope, and obtained from the Hubble Legacy Archive, which is a collaboration between the Space Telescope Science Institute (STScI/NASA), the Space Telescope European Coordinating Facility (ST-ECF/ESA) and the Canadian Astronomy Data Centre (CADC/NRC/CSA). 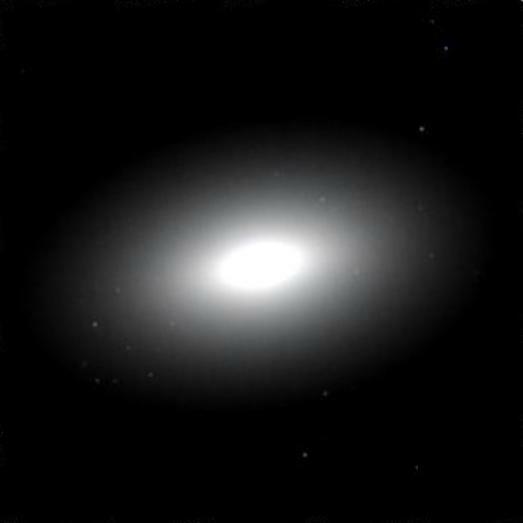 NGC 4473 is an elliptical galaxy with an apparent magnitude of 11.16, located at a distance of 50 million light years in Coma Berenices. The galaxy was discovered by William Herschel on the same night as the nearby NGC 4477. NGC 4473 – Hubble Space Telescope – Hubble Legacy Archive. Based on observations made with the NASA/ESA Hubble Space Telescope, and obtained from the Hubble Legacy Archive, which is a collaboration between the Space Telescope Science Institute (STScI/NASA), the Space Telescope European Coordinating Facility (ST-ECF/ESA) and the Canadian Astronomy Data Centre (CADC/NRC/CSA). 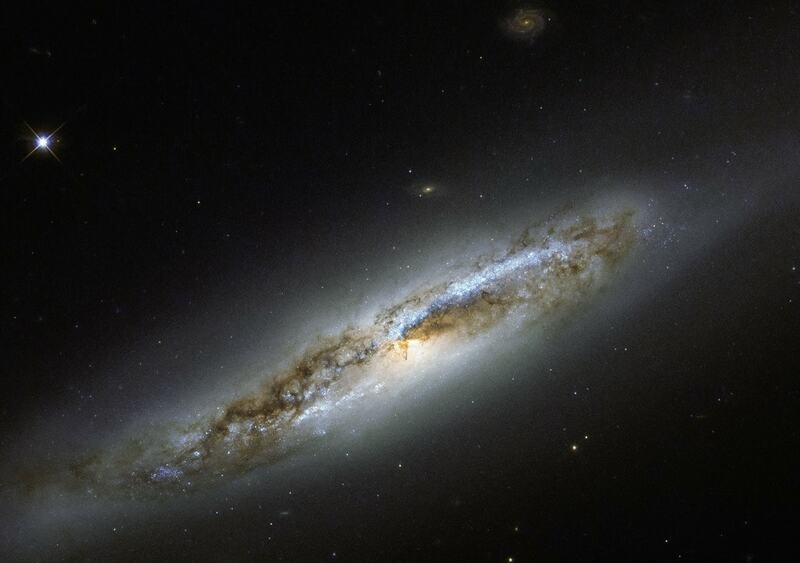 NGC 4459, another lenticular galaxy in Coma Berenices, can be seen at the top of the galaxy chain. Located 49 million light years from Earth, the galaxy has an apparent magnitude of 10.4. It occupies an area 3.8’ by 2.8’ in size. It was discovered by William Herschel in 1784. 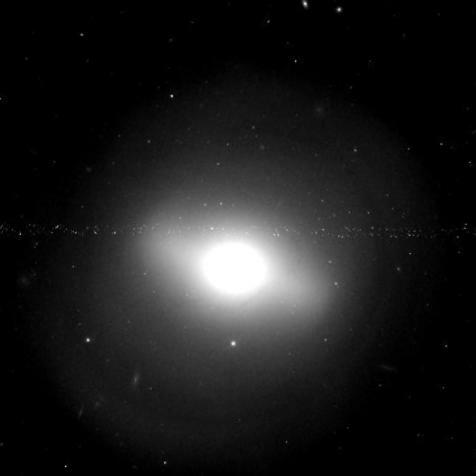 NGC 4459. Based on observations made with the NASA/ESA Hubble Space Telescope, and obtained from the Hubble Legacy Archive, which is a collaboration between the Space Telescope Science Institute (STScI/NASA), the Space Telescope European Coordinating Facility (ST-ECF/ESA) and the Canadian Astronomy Data Centre (CADC/NRC/CSA). 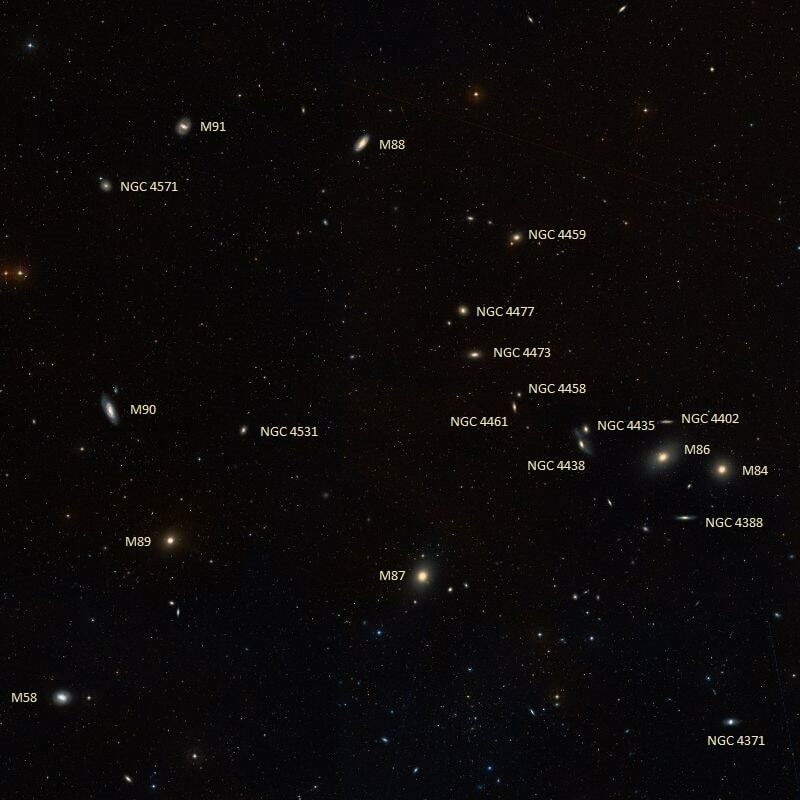 A number of other galaxies can be seen in the same field of view. Notable for its bright nucleus, NGC 4388 is an active spiral galaxy 65.1 million light years away in Virgo. It has an apparent magnitude of 11.02 and is one of the brighter galaxies in this region of the sky. The galaxy occupies an area 6.2’ by 1.674’ in size. 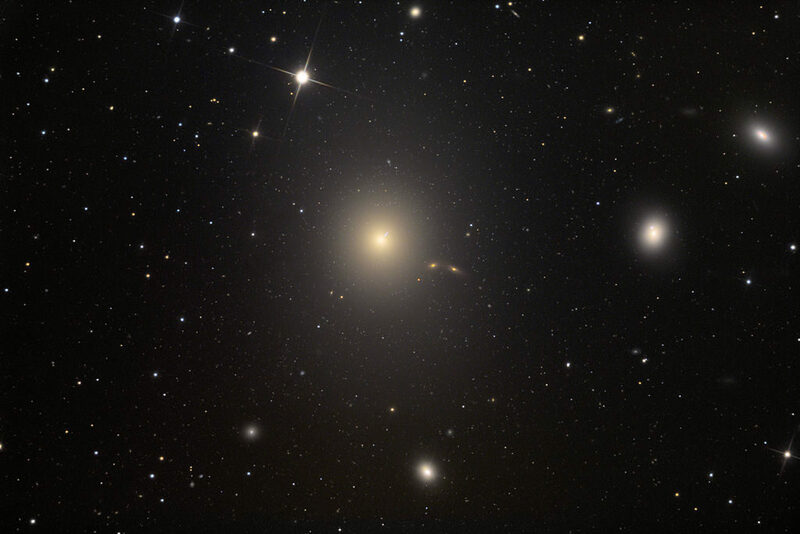 The nearby NGC 4387 is a 12th magnitude elliptical galaxy occupying an area of 1.7’ by 1.1’ in Virgo. With an apparent magnitude of 12.7, the galaxy is slightly fainter than NGC 4388. It was discovered by William Herschel on April 17, 1784. The barred spiral galaxy NGC 4413 in Virgo has a magnitude of 11.9 and, with a linear diameter of 35,000 light years, occupies 2.3’ by 1.4’ of apparent sky. The galaxy was discovered by William Herschel on April 17, 1784. Discovered on the same day, NGC 4425 is a lenticular galaxy with an apparent magnitude of 11.8 located in Virgo constellation. It has an apparent size of 2.8’ by 1’. NGC 4402 is another spiral galaxy in Virgo, seen edge-on. Located at a distance of 48.38 million light years, the galaxy is about 55,000 light years wide. It has an apparent magnitude of 12.55 and an apparent size of 2.967’ by 0.593’. A supernova, designated SN 1976B, was discovered in the galaxy in 1976. NGC 4479 is a lenticular galaxy in Coma Berenices. William Herschel discovered it on April 8, 1784. The galaxy has an apparent size of 1.6’ by 1.3’ and an apparent magnitude of 12.5.